Two tone blue. Used in good condition. 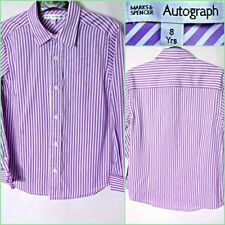 BEAUTIFUL LONG SLEEVE STRIPPED PURPLE BOY`S SHIRT FROM MARKS AND SPENCER - AUTOGRAPH. IT WAS 2 PART SET, BUT FOR SALE IS ONLY THE SHIRT. AGE 8 YRS. CHEST 26" HEIGHT 128 CM. PERFECT FOR MANY OCCASIONS. 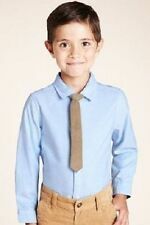 BOYS DARK BLUE LONG SLEEVED SHIRT. USED IN GREAT CONDITION ONLY USED TWICE. BY MARKS & SPENCERS BUTTONS DOWN FRONT WITH COLLAR. GREAT FOR WEDDINGS ETC;. 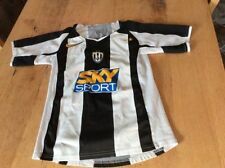 Boys Marks & Spencers long sleeve shirt. size 14.5" collar. chest 35" / 36" to fit height 68-70" (173-178cm). 16% cotton. 13% Linen Lin. Beige in colour.check photo. Marks and spencer. Excellent new shirt. Crisp white fitted shirt only worn only a couple of times, and in excellent as new condition. Concealed buttons. 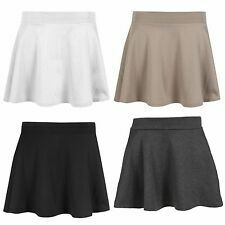 62% cotton, 38% polyester. Underarm to underarm 20”, base of collar to hem 25”. Smoke free home. Boys Marks &Spencer Waistcoat And Cravat Set Size 5-6 Years Brand New With Tags! 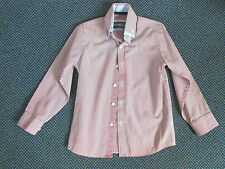 Size 5-6 Years, nice pink colour with lilac tones. 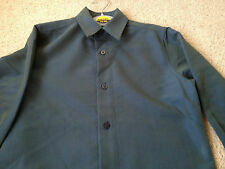 Boy's Blue M&S Short Sleeved School Shirt. Worn and a couple of marks but otherwise in good condition.